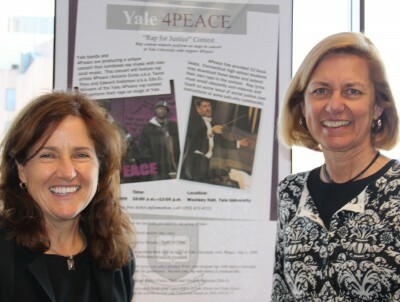 Felice Duffy ’82 (CLAS), ’86 ED, ’91 Ph.D. (left) and Laura Hyer, former director of the Stop Handgun Violence Org in Boston, at the Yale 4PEACE Rap for Justice. Assistant U.S. Attorney Felice Duffy ’82 (CLAS), ’86 ED, ’91 Ph.D., who has found her way from a UConn soccer field to a federal courtroom, says prosecuting criminals is like playing team sports. Ethics and integrity must be present in both, she points out. In court and on the field, prosecutors and athletes alike must perform well without breaking rules. Both need to prepare for their challenge but also must react quickly to the unexpected. And a referee/judge is there to help them play by the rules. A women’s soccer pioneer in her college days, Felice is a criminal federal prosecutor in the U.S. attorney’s office in New Haven. She spent her first year prosecuting gun and drug trafficking violations and has since transitioned to major crimes and national security. Felice is also active in crime prevention and helping former prisoners avoid reincarceration. She works with various community groups to inform and educate. The focus of her recent outreach efforts has been helping women avoid involvement in crimes committed by their husbands or boyfriends, and she was part of a group that created a 30-minute docudrama on the subject. Filmed in a New Haven neighborhood, the docudrama features a scenario in which a woman helps a man she loves cover up a shooting. More than 100 young people auditioned for a role in the film, which also features federal judges and prosecutors. Felice made a positive impact starting with her time at UConn, where she filed a Title IX gender discrimination complaint which led the University to form a women’s soccer team in 1979 that has become a national contender. She was named All-American in her senior year and has been inducted into the Connecticut Soccer Hall of Fame.